Antidepressants are used to alter the concentration of neurotransmitters in the brain that is responsible for the depressed affect (feelings in response to the environment, whether positive and pleasant or negative and unpleasant). Regulate receptor sites and breakdown of neurotransmitters resulting in accumulation of neurotransmitter in the synaptic cleft. 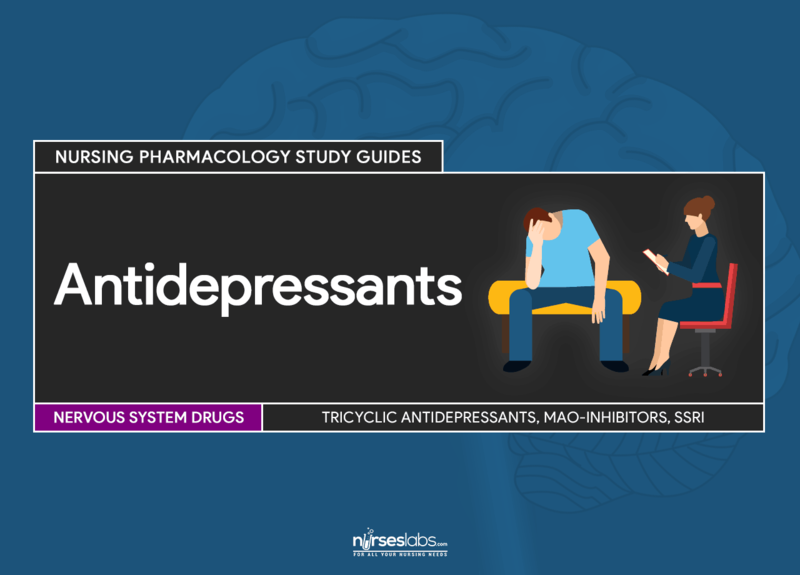 Antidepressants are classified into three groups: tricyclic antidepressants (TCAs), monoamine oxidase inhibitors (MAOIs), and selective serotonin reuptake inhibitors (SSRIs). Depression is an affective disorder characterized by a persistent and intense feeling of sadness much more severe and longer lasting than the suspected precipitating event. There may be no external causes. Individuals with depression have little energy, disturbed sleep patterns, loss of appetite, and absence of motivation to perform activities of daily living. They describe overwhelming feelings of sadness, despair, hopelessness, and disorganization. It can interfere with a person’s life, his family, job, and social relationships. It can lead to multiple physical problems that further depression and increase risk of suicide. Researches about drugs that can effectively relieve depression lead to the formulation of biogenic amine theory which states that depression results from a deficiency of biogenic amines (NE, dopamine, and 5-HT) in key areas of the brain that regulate arousal, alertness, attention, moods, appetite, and sensory processing. The choice of TCA depends on individual response and tolerance to the drug. By inhibiting presynaptic reuptake of NE and 5-HT, there will be an accumulation of these neurotransmitters in the synaptic cleft which will increase the stimulation of the postsynaptic receptors. Primarily indicated for the relief of symptoms of depression, particularly anxiety and sleep disturbances. Some TCAs are indicated for enuresis in children older than 6 years. Researches on its possible indications for treatment of chronic and intractable pain are currently conducted. TCAs also act as anticholinergic. Clomipramine is approved for use in treatment of obsessive-compulsive disorders (OCDs). Indication for treatment of depression in children is a challenge because children respond unpredictably. Studies have not shown that antidepressants in children are effective. On the other hand, it is linked to increased suicidal ideation and behavior in depressed children. Only clomipramine, imipramine, nortriptyline, and trimipramine have established pediatric doses for children older than 6 years. Adults must be educated that effects of drug therapy may not be seen for 4 weeks. Also, cause of depression must be ruled out before therapy begins. Use cautiously for pregnant and lactating women because of potential adverse effects to fetus and baby. Doses of these drugs need to be reduced and careful monitoring for drug toxicity is a must, especially for those who have hepatic and renal impairment. Allergy to TCAs. Prevent severe hypersensitivity reactions. Abrupt cessation causes withdrawal syndrome characterized by nausea, headache, vertigo, malaise, and nightmares. Assess for the mentioned cautions and contraindications (e.g. drug allergies, hepatorenal diseases, psychosis, glaucoma, etc.) to prevent any untoward complications. Assess for history of seizure disorders, psychiatric problems, suicidal thoughts and myelography within the past 24 hours or in the next 48 hours to avoid potentially serious adverse reactions. Perform a thorough physical assessment to establish baseline data before drug therapy begins, to determine the effectiveness of therapy, and to evaluate for the occurrence of any adverse effects associated with drug therapy. Monitor results of electrocardiogram and laboratory tests (e.g. renal and liver function tests) to monitor the effectiveness of the therapy and provide prompt treatment to developing complications. Limit drug access if patient is suicidal to decrease the risk of overdose to cause harm. Administer a major portion of dose at bedtime as ordered if drowsiness and anticholinergic effect are severe to decrease the risk of patient injury. Provide comfort measures (e.g. voiding before dosing, taking food with drug, etc.) to help patient tolerate drug effects. Educate client on drug therapy to promote compliance. Monitor patient response to therapy (e.g. alleviation of signs and symptoms of depression). Monitor for adverse effects (e.g. hypotension, suicidal thoughts, cardiac arrhythmias, etc). Evaluate patient understanding on drug therapy by asking the patient to name the drug, its indication, and adverse effects to watch for. Monoamine oxidase (MAO) is an enzyme found in nerves and other tissues. MAOIs exert their effect in relieving depression by inhibiting this enzyme to break down the biogenic amines NE, dopamine, and 5-HT. Now used rarely because of their strict and specific dietary regimen to prevent toxicity. However, there are patients who respond only to MAOIs and so these remain to be available. By blocking the breakdown of the biogenic amines, these drugs pave way for the accumulation of NE, dopamine, and 5-HT in the neuronal storage vesicles to cause increased stimulation of the postsynaptic receptors. This increased stimulation is thought to be the reason for the relief of depression. MAOIs are generally indicated for patients who do not respond to other safer antidepressants. Avoided in children if at all possible because of the potential for drug-food interactions and serious adverse effects. Adults must be educated that effects of drug therapy may not be seen for 4 weeks. Also, the cause of depression must be ruled out before therapy begins. Allergy to MAOIs. Prevent severe hypersensitivity reactions. Phentolamine is the treatment for hypertensive crisis. Assess for the mentioned cautions and contraindications (e.g. drug allergies, hepatorenal diseases, cardiac dysfunction, etc.) to prevent any untoward complications. Limit drug access if the patient is suicidal to decrease the risk of overdose to cause harm. Monitor patient for 2-4 weeks to ascertain onset of full therapeutic effect. Monitor blood pressure carefully to determine the possible need for dose adjustment. Secure phentolamine at the bedside as a treatment in case of hypertensive crisis. Educate client on a low tyramine-containing diet. Provide a list of potential drug-food interactions that can cause severe toxicity to decrease the risk of a serious drug-food interaction. Provide comfort measures (e.g. voiding before dosing, taking food with the drug, etc.) to help patient tolerate drug effects. Monitor for adverse effects (e.g. hypotension, hypertensive crisis, cardiac arrhythmias, etc). SSRIs is the newest group of antidepressants available in the market. Only has blocking effect on the reuptake of 5-HT and has little to no effect on NE. Have lesser adverse effects compared to TCAs and MAOIs. This makes them a better choice for many patients. Blocks the reuptake of 5-HT and therefore increases its level in the synaptic cleft. Realization of full therapeutic effect is up to 4 weeks. Indicated for treatment of depression, OCDs, panic attacks, bulimia, premenstrual dysphoric disorder (PMDD), social phobias, and social anxiety disorders. Can cause serious adverse effects on children. Only fluvoxamine and sertraline have established pediatric dosage guidelines for treatment of OCDs. Fluoxetine is widely used to treat depression in adolescents. Must be educated that effects of drug therapy may not be seen for 4 weeks. Allergy to SSRIs. Prevent severe hypersensitivity reactions. Assess for the mentioned cautions and contraindications (e.g. drug allergies, hepatorenal diseases, severe depression, and suicidality, etc.) to prevent any untoward complications. Perform a thorough physical assessment to establish baseline data before drug therapy begins, to determine the effectiveness of therapy, and to evaluate for occurrence of any adverse effects associated with drug therapy. Arrange for lower dose in elderly patients and in those with renal or hepatic impairment because of the potential for severe adverse effects. Monitor patient for 4 weeks to ascertain onset of full therapeutic effect. Establish suicide precautions for severely depressed patients to decrease the risk of overdose to cause harm. Administer drug once a day in the morning to achieve optimal therapeutic effects. Suggest that the patient use barrier contraceptives to prevent pregnancy while taking this drug because serious fetal abnormalities can occur. Provide comfort measures (e.g. taking food with the drug) to help patient tolerate drug effects. Monitor for adverse effects (e.g. sedation, dizziness, respiratory dysfunctions, GU problems, etc). Nortriptyline and protriptyline are classified as what class of TCAs? Examples of amines include amoxapine, amitriptyline, clomipramine, doxepin, and clozapine. Example of tetracyclic include maprotiline. External causes always play a part in assessment and diagnosis. Patients with depression have trouble sleeping and eating. Depression can lead to multiple physical problems. Depression can have no external causes. Which TCA is also approved for use in patients with OCD? A combination of MAOIs and TCAs will precipitate which drug adverse effect? It is accompanied by convulsions, hypertensive episodes, and even death. What is the treatment for hypertensive crisis caused by MAOI? How many weeks will the full therapeutic effects of SSRIs be realized? Therefore, it is important for nurses to instruct patients that effects of the drug will not be instantly feel and experienced. 1. Nortriptyline and protriptyline are classified as what class of TCAs? A. External causes always play a part in assessment and diagnosis. B. Patients with depression have trouble sleeping and eating. C. Depression can lead to multiple physical problems. 3. Which TCA is also approved for use in patients with OCD? 4. A combination of MAOIs and TCAs will precipitate which drug adverse effect? 5. What is the treatment for hypertensive crisis caused by MAOI? 6. How many weeks will the full therapeutic effects of SSRIs be realized? 1. Answer: B. Secondary amines. 2. Answer: A. External causes always play a part in assessment and diagnosis. 4. Answer: B. Severe hyperpyretic crisis. 6. Answer: B. 4 weeks.